Paris Saint-Germain have reportedly opened talks over the transfer of Barcelona midfielder Ivan Rakitic and are preparing an £81million opening offer, according to Sport. While the report states the Croatia international may need convincing to leave the Nou Camp for the Parc des Princes, it’s also claimed he would be offered the chance to double his wages with PSG. 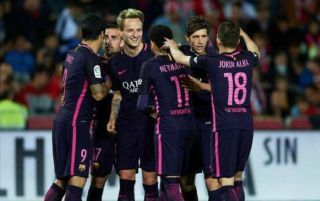 Barcelona, meanwhile, have made it clear they can’t currently afford to give Rakitic a new deal, according to Sport. It remains to be seen how this one will pan out before the end of the transfer window, which closes for La Liga, Bundesliga and Ligue 1 clubs at the end of this month. The chance may have gone for Premier League and Serie A clubs to sign players, but that doesn’t mean there won’t still be some big movers. Rakitic is undoubtedly one of the finest in Europe in his position and a potentially big signing for PSG as they look to build a squad capable of winning the Champions League. The 30-year-old won the trophy with Barca back in 2014/15, scoring the opener in the 3-1 final victory over Juventus. PSG have not had as much luck in Europe in recent times, but an experienced, quality performer like this could be just what they need to bridge the gap.